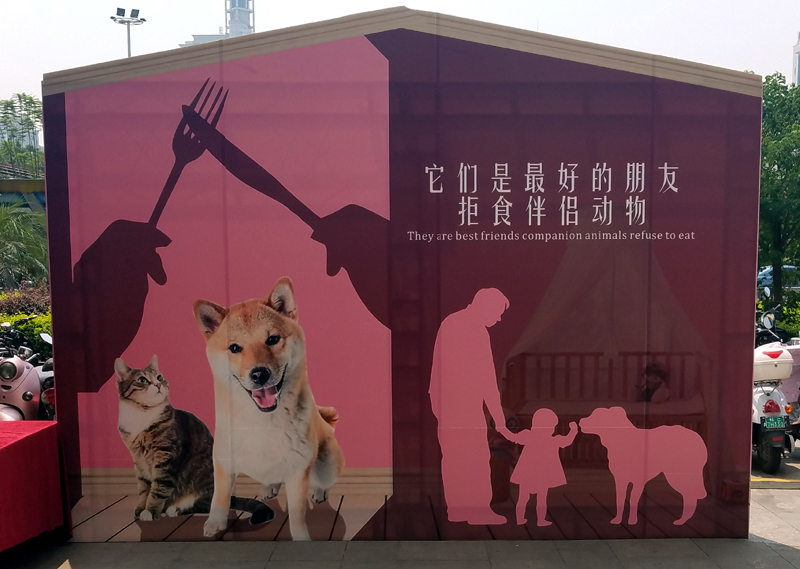 Over the weekend, some animal protection type people outside Bubugao shopping hell have been urging people not to eat! I’m guessing they mean dogs and cats. While over the last few years, the new middle classes’ desire for status symbol pets has increased exponentially and the consumption of “pet meat” has declined, they seem to me to be somewhat selective in their objection list. Presumably, all other animals are fair game. Whatever, this is the first time I’ve seen even such mild active resistance in Liuzhou, although it has been common elsewhere. PETA types have succeeded in giving what was a tiny, much ignored event in Yulin world wide publicity. Well done. For the record, I have eaten dog, but wouldn’t recommend it. Not for emotional reasons – it just doesn’t taste very good. I haven’t eaten cat to my knowledge, but I do know where to buy it. The meat of carnivores (other than seafood) is seldom very good.
. This entry was posted on Sunday, September 16th, 2018 at 8:38 pm	and is filed under Food and Drink, Liuzhou News. You can follow any responses to this entry through the RSS 2.0 feed. Both comments and pings are currently closed.